My favorite way to shop for veggies is to walk into the produce shop and pick out the things that look the weirdest or that have the most striking names. 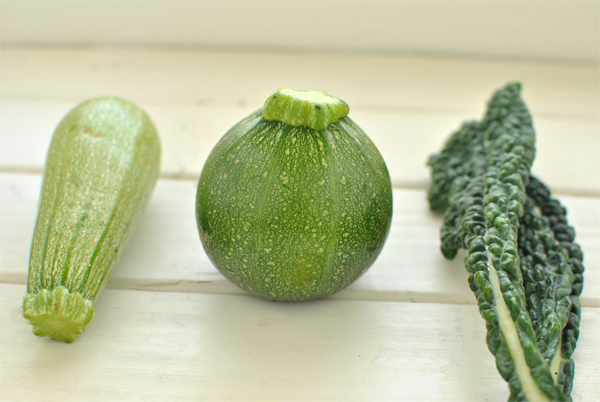 That’s how I came home with a bag full of white zucchini, round zucchini (or “alien heads” as Nathalie called them), and dinosaur kale. After finding bacon and gruyere in the fridge, I realized a most brilliant way to use all the veggies in one dish: make a quiche! 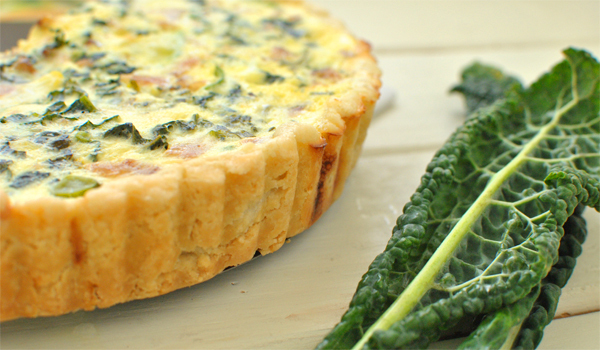 Quiche is one of those wonder foods that’s great anytime of day, don’t you think? I used this rich buttery crust recipe again (minus the sugar) which was the perfect foil to the light and fluffy egg mixed with the smokiness from the bacon and the bite of all the veggies. This one is my new favorite recipe. In a food processor, combine flour, butter, and salt. Pulse until mixture resembles coarse meal. Add ice water, 1 tbsp at a time. Pulse until dough is crumbly, but holds together when squeezed. Do not overmix. (Note: If you don’t have a food processor, combining the dough ingredients in a large bowl and using a pastry cutter also works nicely). Remove dough from food processor and shape into a disk. Wrap in plastic wrap and refrigerate for 1 hour. In a skillet, fry bacon until crisp. Crumble and set aside. Pour out excess grease but don’t clean the pan. Add veggies and cook until done but still crisp. Salt mixture to taste. Remove from heat and allow to cool for about 20 minutes. Roll out pie crust and press into tart pan. (I had enough dough to make an extra smaller pie, too.) In a large bowl, beat eggs with half and half. Add grated cheese, salt and pepper, and set aside. With a slotted spoon, add veggie mixture into egg/cream mixture. Stir together. Add bacon and stir. Pour into pie crust(s) and press to submerge ingredients. Cover loosely with foil, place on a baking sheet, and bake at 400 degrees for 1 hour. Bake for slightly longer if quiche is overly jiggly. Remove from oven and allow to set for ten minutes before serving. Remove quiche from pan and slice into wedges.